Affiliate links are provided in this post for your convenience, see full disclosure here. Decorating mistakes happen and sometimes I have to admit I’m wrong. True, it happens. 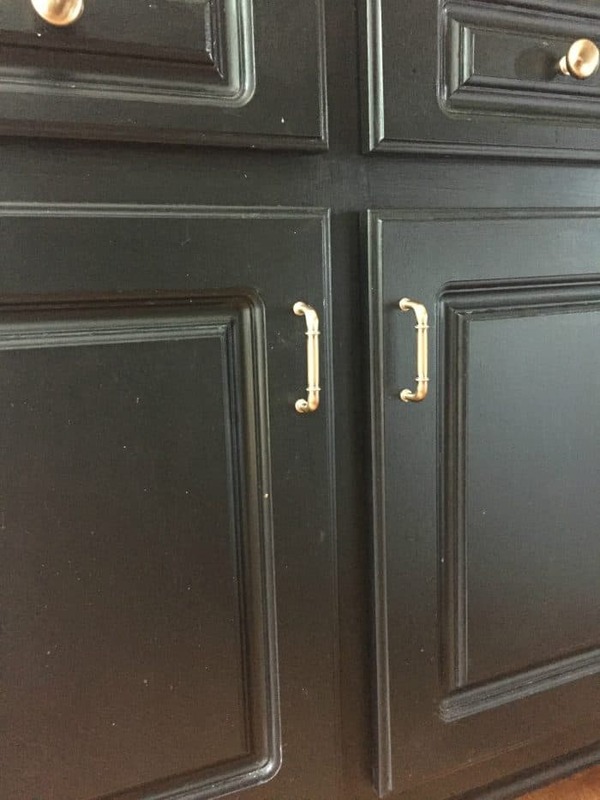 You see, I had wanted my cabinets black for a long time. 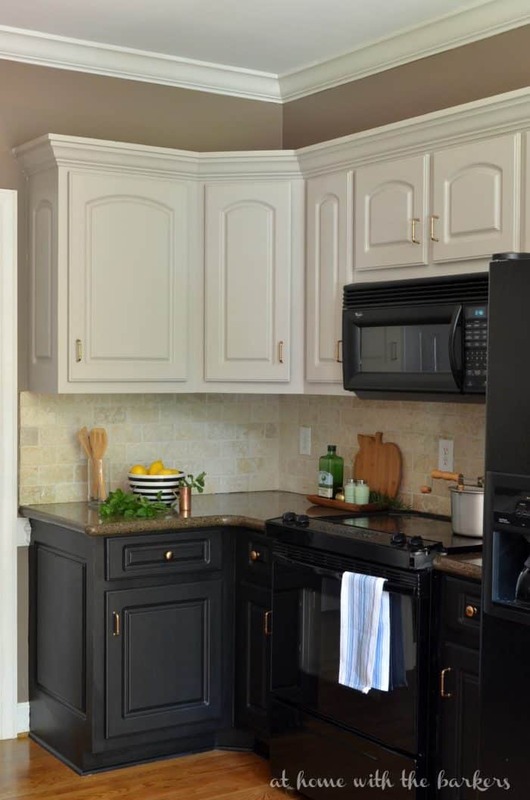 When I first saw the kitchen of Layla from The Lettered Cottage years ago I wanted to try black kitchen cabinets in my own home. Last Spring I painted my cabinets as part of the One Room Challenge 6 week room makeover. I decided on a two tone look with the bottom cabinets black. 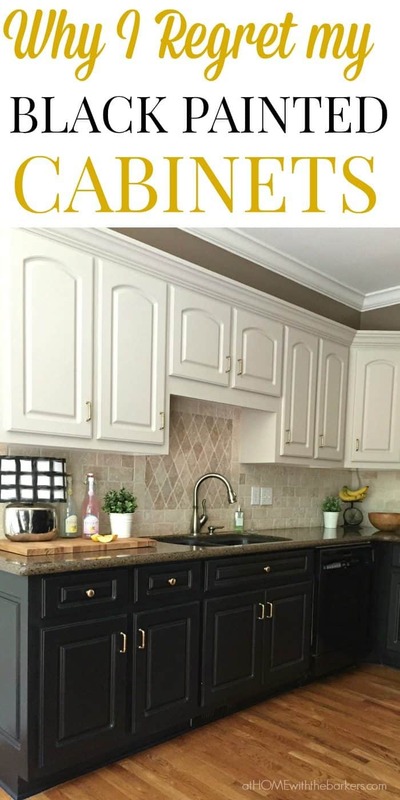 I’m writing this post, black kitchen cabinets the ugly truth as my 18 month review. First, I really do love black painted furniture in home decor. The TV cabinet in my living room is painted black and it looks amazing. It’s a free standing piece with lots of light color around it so it holds its own well. Secondly, this chalky finish paint I used on my cabinets has held up really well. I use it all the time on painted projects. You know how in fashion black is slimming? Well it’s true for black painted cabinets in my kitchen as well. The way my kitchen is designed I have lots of light by the breakfast table as you can see here. The big window and the white wood planked walls help. The ceiling is vaulted and carries great light. When you turn around and face the kitchen area of this space the ceiling drops down to the same height as the rest of my house, nine feet. It does look pretty but you can see how the lower cabinets almost disappear. These photos were taken on a very bright day but you can imagine how dark it looks at night and on cloudy days. I spend so much time in this space that it sort of brings me down. I think this is the one time when slimming black is a bad thing. In home decor I usually strive for making a space feel larger not smaller. The other and most annoying thing about the black in my kitchen is how dirty they always look. Have you ever owned a black car? Well, I have and this is the same idea. I know that I can wipe my cabinets down but I don’t want to do that every time I cook. . All the neat freaks just gasped, lol. They look dirty all the time. Food and dust show up easily. I am about to get real here and show you some true life unedited photos I took today with my iPhone. You can see what I have to look at on a daily bases. It looks terrible, I know. I have lived with this long enough and I am ready to go back lighter. The cabinets were antique white with glaze before the black and I am currently trying to decide on true white or a creamy white. You can see them HERE and HERE. I’d love to hear what you think about black cabinets. Leave me a comment. I’m so glad I am not alone! I will be repainting and I will be sharing all the details on the blog. I do not plan to strip them but I have to put some thought into it because of the soft varnish. I’ll definitely share! Mine were black up until a month ago. I was sick of them! Yes they looked filthy all the time,and made my kitchen gloomy. I repainted them white and they look so clean and bright and open up my kitchen so much! So glad I changed. Finally, someone who understands me! I think I’m ready for white. Mine are currently a light gray. You don’t have to strip them. I just repainted my lowers with a lighter color: Aqua. I used DIY chalk paint, covers well! For sure! They have chalk paint on them now so I am considering it again. Since you have lived with them and have the experience I can understand why you are ready to lighten up the black cabinets. But it does look pretty. My island is chocolate brown and I have the same issue … no matter how much I clean it, it ALWAYS.LOOKS.DIRTY. Painting it is near the top of the list. Picking a color is always the hardest. Glad to see I’m not the only one! This is true for black counter tops as well. I had a dark black polished granite for years and we switched it out for white marble a few years ago — it is so much easier to keep clean looking. I had to dust my counters daily, so I can imagine the cabinets are a dirt/dust/spill magnet as well. Black always looks stunning when clean but it’s a hassle! I wonder if the same would be true with (oiled) soapstone counters? Does dust show up as much on them as a polished, black granite? That’s a great question, I’m not really sure BUT I have dark counters with black and brown in them and they do show a little dust in the corner that doesn’t get wiped as often. I have black cabinets and I love them!! 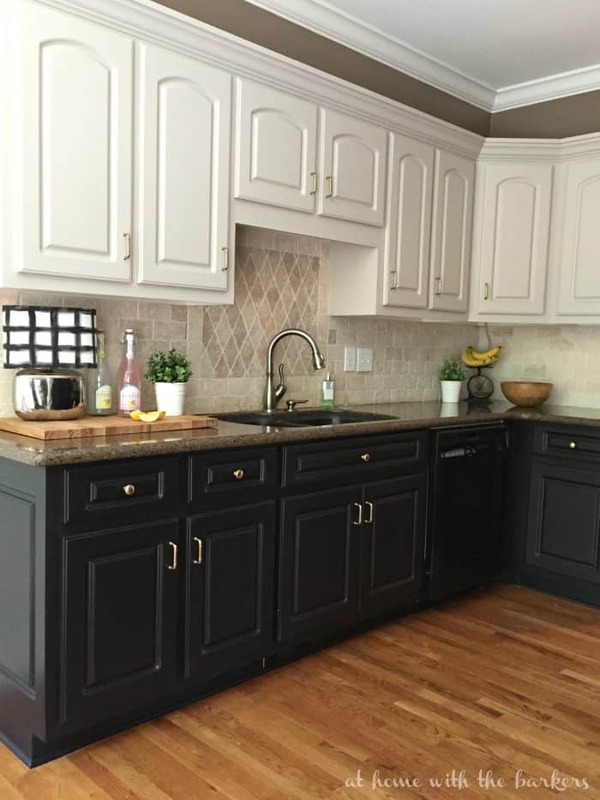 I’ve never cared for white or cream cabinets in the kitchen, so when I had the opportunity to paint our new cabinets 12 years ago, I went with black and have never regretted it. I painted my solid cherry island cabinets black and I love them! Yes – it is a task to keep clean but that’s to be expected in a kitchen that gets used. I love the elegance black brings to any room. By the way – my creme painted/distressed vanity requires the same amount of maintenance do to hairspray, makeup, etc… if you live in you’re gonna have to clean it – you might as well enjoy it!! 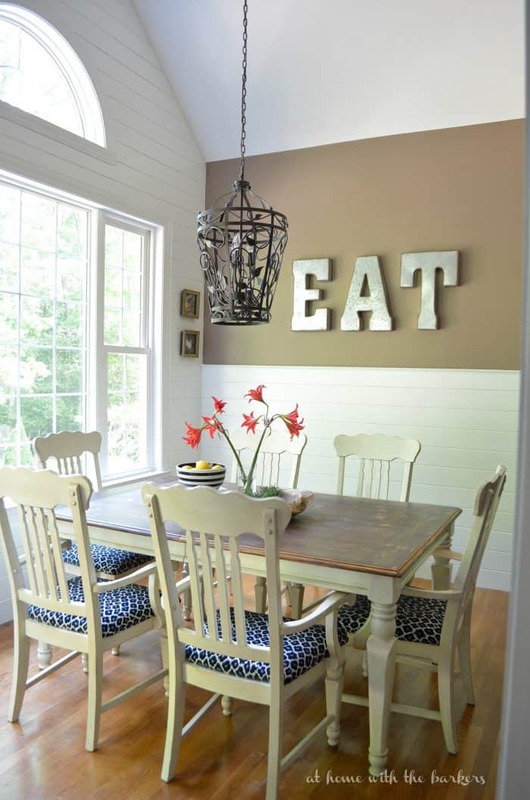 I used DecoArt Chalk paint but when I repaint mine I will go back latex paint. I don’t want to have to seal or wax them. I do find black cabinets to be beautiful in decor. Thank u so much. I already had my Rustinoleum tinted black . I am just now taking the cabenets down. I was having doubts. You’re comment eased sime of my anxiety. Thank you. I glad you posted & shared this idea on blk cabinets in your kitchen. Sorry that it didn’t go well for you. I think maybe you may want to try Navy blue instead w light gray & smokey grey. Don’t forget some beautiful antique white. Good luck and if u decided post plz. Good Morning, I too decided about 3 years ago to paint my kitchen cabinets black, plus I painted the doors to the pantry , bathroom,. ,mudroom also black. I agree they always look dirty!!!!!!!!!!!!!!! I want so badly to paint them white, I used Benjamin Moore Advance Paint to paint my cabinets, have had some chipping, did all the prep, I understand !!!!! Yes, dark cabinets always show EVERYTHING. I cannot keep my cognac cabinets clean to save my life. Water, dust, lint, etc shows up all the time, not to mention the messes the kids make in their morning rush out the door for school….or the messes while on break! I am thinking of going lighter but the hubby loves the cognac stain over the cherry wood. I LOVED your black cabinet choice. I have not however been brave enough to paint my ugly 1990 oak yet. I was just going to do my island black and the rest white. I’m so glad you published this article. I have a tiny kitchen it is about a 12×12 space with a sliding glass door but not connected to any other rooms. I can’t do dirty and with your description this would not have been a good choice for me. So Thank You Thank You Thank You for posting this!!!!! There is ugly truth in everything we do and everything we use and that ugly truth is: ” YOU HAVE TO CLEAN OR ELSE” and we have all seen the ‘WHAT ELSE AFFECT”. So black doesn’t requireno more cleaning than your toilet does; simple because it is black. It is a good color. a good choice and it will always be a classy color / choice when done right and maintained right….anything thrives if iti is kept up. 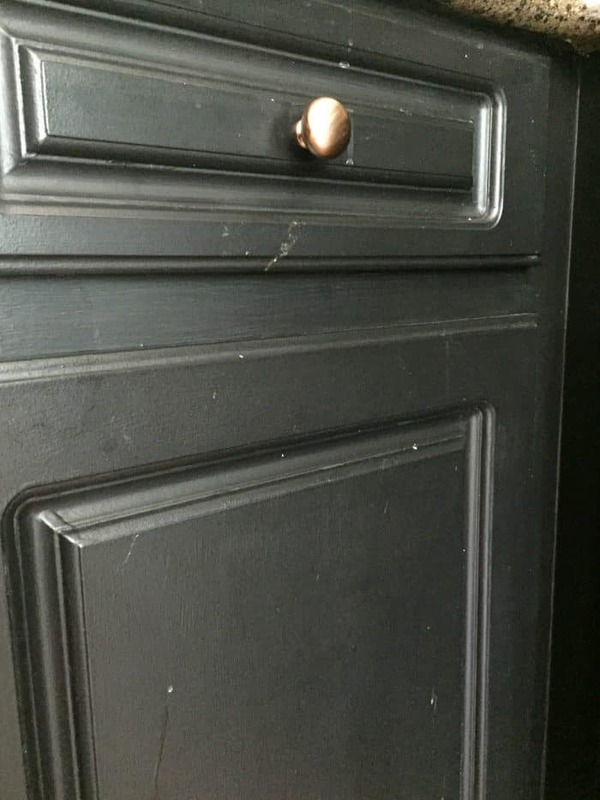 Which is why the black chaulk / chalk paint is the best color you could ever use on kitchen cabinets, fireplace and doors any color chalk paint not just black….looks great and professional. So don’t be discouraged into not using black . Her kitchen is gorgeous but, remember.. she is looking at her kitchen thru her own eyes, and we are ususal our own worse critics. I love her kitchen but as the saying goes: ” If you use it on a regular basis, you have to clean it on a regular basis”. I have two sets of built-in and my master bath cabinets, all painted black. They were painted by the previous owner. They do look wonderful from a distance, but up close, you can see every spec of dust. I’m thinking of trying to dry brush them with a lighter color to try and “hide” the dirt?? I only did my doors and countertops black. The rest of the cabinets are creamy white – I love them! Just enough of each color. I’m not sure what picture you need? Can you email me directly sonya@athomewiththebarkers.com to let me know what you’re referring to? Can you try and rub them with a dryer sheet? I know it works on my trim work but they are lighter. Dust just doesn’t stick as well. I don’t know if it will leave a residue or not on a darker cabinet. It might be worth a try. Uuuggghhh…. I had finally decided on black kitchen cabinets and was pinning a picture of your kitchen because it looks so much like mine! After reading this, I am re-thinking! Maybe a warm, rich greige to match the granite??? You can see my kitchen on my blog alongtheselinesdesign.com (I’m a a newbie blogger so please don’t judge my site, I’m not completely finished getting out the kinks or the look.) All in all I like your kitchen, especially since the upper and lower cabinets are different. I would love to incorporate that someday in mine. Sounds like yours have worked out well. Thats awesome! Did you use Annie Sloan Soft Wax too? Or just the Artisan Enhancement clear finish? No, I did not. Only the soft varnish. After 30 years in design and trying to convince owners NOT to paint all white, a mistake that most regret soon, I love a kitchen with color. I think the fact that you have short wall cabs and five colors on those walls do not help. White crown, break with what looks like a greige, break with another version of white, break with tile and finally, the black cabs. It’s a lot for the eyes to take in. First think you’re taught in design school, too many vertical breaks confuse the eye. I’m on house #6, all of them with black kitchen cabs and loving it! Although, I never use pure white on trim or walls, finding the right shade of paints to work with the cabs is a must. As for the cleaning issue, I would rather wipe down the cabs in question as I wipe down the counters. Too many times you see dirty cabs because the owner “thinks” you can’t see the problem. Even on white, or light wood, you must wipe them down. Dirt always shows, it’s part of it’s dirty nature! 😉 Love the plank wall! I painted my lower cabs, pantry door, and built in shelves and mantel in the adjoining family room in BM Eclipse, a darkish-gray with blue tones. It’s gorgeous with the white upper cabs and trim, and white walls. I had worked in a place with black countertops back in the 80s and knew that black would show every speck; the gray doesn’t unless it’s quite large. Don’t know what your plans for repainting are, but it would think it would be easier to go for a mid-tone over the dark than trying to go to white. You’re absolutely right. Black doesn’t work!! My permeter cabinets are Antiqued Black, which softens things. I also have a section with open shelves and some with glass fronts and a copper sink. Light granite counter top. My large island is antiqued white cabinets with black granite. My kitchen looks huge and I receive so many complements. Six years later I still love it. I looked at your pictures and have to admit that I don’t like the black on the bottom and white on top. Too much contrast. And I prefer my antiqued black to solid black. Which happens to be my signature finish for my company products so a little biased! Lol. Interesting post. Thanks for sharing. Thanks so much for joining in the conversation. Yours sound amazing and I love the antiqued black look! Personally I don’t like dark kitchen cabinets but your black cabinets look pretty in the picture. However, I don’t love the black/white 2-tones cabinets, they just don’t seem to go together for some reason….maybe it’s just me. Yep, pretty much the same problem I’m having. 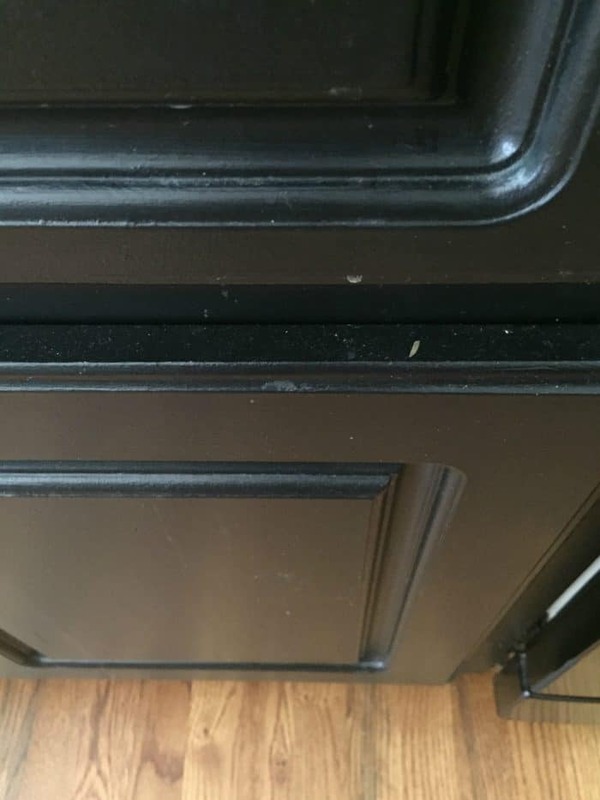 Just moved into a house with black cabinets and I hate them. And boy did this lady love black. Black mantelpiece over the fireplace and even our master bath is painted black yep ( on the walls, blech). But my kitchen is where I spend the most time so I really want to paint them like ASAP. Anyways, enough about me I think you should paint them white or cream it would look lovely. That’s the plan, thanks! Good luck with all that black you have. GOOD LUCK with your next kitchen adventure!! Cant wait to see what you do!!! Black has limited use range in lots of places. Difficult to keep clean&light. Open and/or well illuminated areas are welcome though. I totally agree! I made the same mistake and am now painting my cabinets light grey. Did you get around to repainting your cabinets? I have the same kitchen colors as you, but with birch cabinets and I’d love to see what you decided on! Holding head in shame…no, not yet. Hopefully very soon! I am a big fan of white and would have never considered black cabinets but they were very nice. They looked smaller than he above cabinets. I did not care for the mix of colors. Top and bottom cabinets should have been black and the brown at the ceiling could have been white but red would have been better. The mixture of the black, white and brown is to much color scheme for me. I feel the same way about all white cabinets! It really is to bad, the black is so dramatic! I personally don’t care for the white and glazed, those look dirty to me. The crisp white is definitely a winner! I wonder if this is true for a dark, not black, stained wood. I would like to hear about white too- we are building and I’m trying to convince my husband to go with white but he keeps mentioning the dirt factor. I don’t like “wood color” (haha) so dark seemed to be his compromise. Call me crazy but I love the look of the black cabinets. I totally understand the seeing all dirt thing, I have a black vehicle, trust me I get it. I feel as though if the back splash were gray instead of beige/tan, it would allow the eye to slowly move down to the cabinets. Something about Black and Tan with me, I feel they don’t play off each other well. Either the black makes everything seem tiny, or the beige seems darker than anticipated, or the black stands out like a sore thumb because it’s the only dark color in the room. I currently have cream cabinets (previous homeowner painted them) and I hate them! Every single thing that may have some kind of red in it stands out. Fuzz, sauce, wood grain, tile, I don’t see cream, I only see the red. I also have a dark colored flooring and counter too (previous homeowner as well), which I also hate. 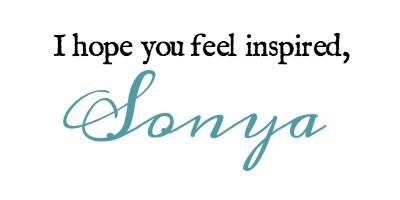 I am so glad to have come across this blog!! We are just about to remodel a kitchen from scratch in a house we are purchasing. Plan is to go all white but I’ve considered doing a Navy blue on the island. Your post about the dilemma of white and black has really helped!! THanks!! I agree with you! We started off with black cabinets without knobs, that was a big nightmare staring at everyday! So we got knobs, they are still look dirty all the time! So done with black! I agree I hate my black cabinets I did an island and above my cooktop and they look like crap all the time they show everything and do not wear well. Mine were done by the cabinet maker. BAD finish in them. I surfed in to read your excellent tutorial on glazing cabinets, and have followed the “cabinet saga” around the blog. Last week I impulsively had my contractor tear out the bottom cabinets (1970’s era, yuck) and yesterday painted the uppers white. I cannot tell you what a relief it has been to have all the space back…even if the family is tired of eating cereal or hummus for almost every meal, lol. But I was considering black kitchen islands to replace the cabinets, and I cannot imagine giving myself more cleaning issues (having just had the joy of cleaning under installed cabinets, a traumatic experience) or making the space look smaller. So I thank you so much, for your clear, useful, and friendly blog. What did you go with and is there an updated post? I want to paint my kitchen cabinets white white, but concerned about protective coats yellowing over time! Black in a kithen has never been a choice I would make for the reasons you have mentioned. I have also noticed the modern houses that have black kitchens don’t resale very easily and have dropped the their prices. I have black cabinets and I LOVE them. Yes, they get dusty and dirty, but so do white ones and I’d rather see the dirt and clean it than just have it hidden. I just wipe the cabinets here and there when I’m doing dishes. Not that big of a deal. I don’t regret mine at all. I’ve recently done up my kitchen, ripping out a ’60s’ wall of cupboards and replacing it with a pantry and lowerdrawers instead. The drawers are black with silver handles, the benchtop is a motley mix of grey, white and black flecks (barely shows any marks/dirt) and my walls are white (tile to about .8m, then paint above). I went with a mid grey for the pantry doors, window sills and the outer frame, with white on the inner frame. The grey hides the dust really well! The kitchen looks huge now. I am about to do the floor and was considering a wood-look like pine, but I don’t think that works so well with the black so will likely go for a grey wood look which should pick it up even more. I think it’s just getting the mix of colours right, and not too many colours in one area. I really like my black/grey/white mix. We’ve added spots of red, ie, the jug and tea, coffee, sugar canisters. I’m redoing my kitchen now and i’m definitely going with Black cabinets. They bring class, elegance, and coziness to any room. I see a lot of people saying that dust / dirt show on them, which I am absolutely expecting. But I’m surprised by the people who want to go lighter so they don’t have to clean their kitchens and cabinets as much. The same amount of dirt, dust, food, etc will collect on the cabinets and countertops regardless of color. I’d rather take a few minutes each day to wipe/dust down my kitchen than cook in a dirty one. Seems to me people are taking a lazy approach by going white so they purposefully don’t have to clean because dust doesn’t show. Trust me, it’s still there. Gross. You said it yourself – like having a black car, everything shows. You’d think it be the opposite, but it’s not. Don’t look at something you hate a minute more! There’s no shame in changing it the first time or again this time. A favorite saying ‘where there is light, there can be no darkness’. Best of luck! I am a professional interior designer and while my work is not in kitchen and baths I do know that a “chalk paint” on a cabinet is going to give you a matte finish which is going to be terrible difficult to keep clean in such a high use area. But as has already been mentioned, regardless of the color, kitchen cabinets get dirty. Satin, gloss or semi-gloss will give you much improved results with cleanability. I painted my cabinets black which I do like. I am trying to figure a color for my island. It is a gray blue. Any ideas I want to keep yellow walls. Love the table and chairs! Can you tell where they are from?